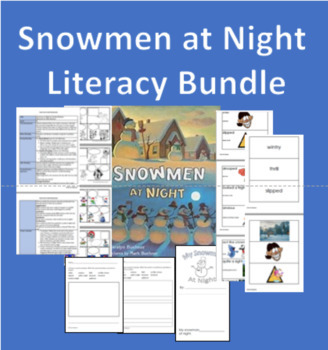 This bundle contains multiple items that can be used to supplement read alouds or guided reading lessons that feature Snowmen at Night. In this resource, you will find: ideas for read aloud or K level guided reading lessons that includes before, during, and after reading activities, suggestions for center activities and comprehension questions based on Bloom's taxonomy, ten printable cards with vocabulary words/phrases from the story, printable matching activity with words and phrases, two different vocabulary worksheets, a booklet students can use to write about their own snowman's adventures at night, and four different comic strip template to encourage using dialogue when writing. My Snowman at Night Booklet also available separately.